Driving from the Peninsula to Marin or Sonoma, I always drive through San Francisco for the sake of driving on the Golden Gate. I'll even sit through the residential traffic on the 101 (not to mention I get to avoid the toll on the Richmond Bridge). The traffic has never been too terrible, even around rush hour, and driving the toll-free way out of the city is definitely the way to go. The "last exit before the bridge" sign is clear and easy to read, so you likely won't get stuck in Marin if you don't mean to. The views from the Golden Gate are consistently stunning and breathtaking. Looking off of the bridge, you can see the city, and once you cross into Marin the hills are just lovely. Pedestrians seem to agree, as I almost always see people walking or biking on the bridge. It does appear to get a little crowded, but this quintessential San Francisco site cannot be beat. FlowerGirl Probably the best, most iconic bridge in the world--though I prefer to look at it than take it. A better route into Marin if you're in the East Bay is up 580 and over the San Rafael Bridge! 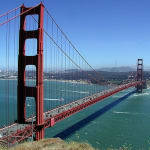 Travelling to Golden Gate Brg?